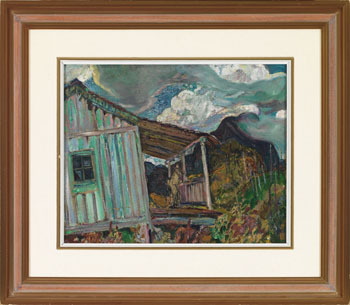 Varley produced a number of sketches at the ranger’s cabin, and this setting inspired one of his masterworks, the 1932 canvas Dhârâna, which depicts Vera on the porch of the cabin, gazing reverently upward. Our work also includes a figure, and although it is loosely defined, what is important is the figure’s stance—that of contemplation of this sublime scene. This was a place where Varley felt a meditative union with the landscape, which can be felt acutely here in the extraordinary sky. Dark streamers of clouds float before luminous cumulus towers and entwine around the mountain peak, and the heightened colouration of the brilliant blue sky and the delicate pastel notes in the clouds are exquisite. The sky has a crystalline quality that is heightened to the point of having an almost supernatural quality. Varley’s progression as an artist in Vancouver was prodigious, and he produced a powerful body of work while there. 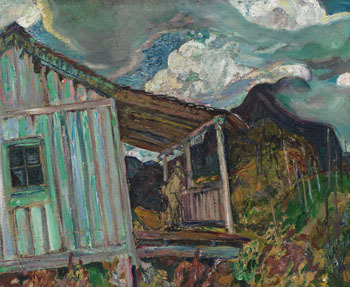 His brushwork was bold and textural, which can be seen in the vigorous paint work here, particularly in the rough wood structure of the cabin and in the sky. His palette was rich and complex, ranging from cool blues and greens to warm pink and mauve. Through his work as an art teacher, he was very aware of colour theory, such as that of Albert H. Munsell, and his use of colour added immensely to the vitality of his work. Varley often used prismatic hues, such as iridescent blue-greens and violet. He believed that objects generated colour vibrations and that each colour had a symbolic meaning, such as blue-green, which represented the spirit. The push and pull between the warm and cool hues in his palette added further dynamism to his work. As well as the lofty peaks and dramatic weather, Varley also gave his attention to the forest floor, covered with bracken, saplings and other small indigenous plants, and this low growth is depicted with delicacy in this painting. In Forest Ranger's Cabin, Lynn Valley, Varley has struck a fine balance between the elements of earth and air. 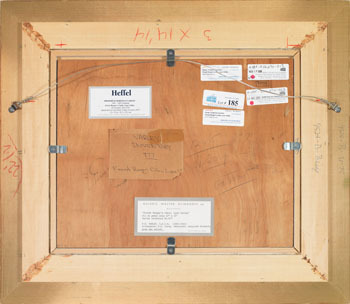 This work is #877 in the Varley Inventory listing.